It’s time for another Comic Preview, and it looks like Archie Sonic #107 will see the continuation of two hot stories for both Sonic and Knuckles. In Crouching Hedgehog Hidden Dragon, the blue blur is battling his way through the Hidden City of the Ancients, while in Reunification Knuckles will deal with the outcome of restoring his family and friends to the Floating Island. Read on for more! 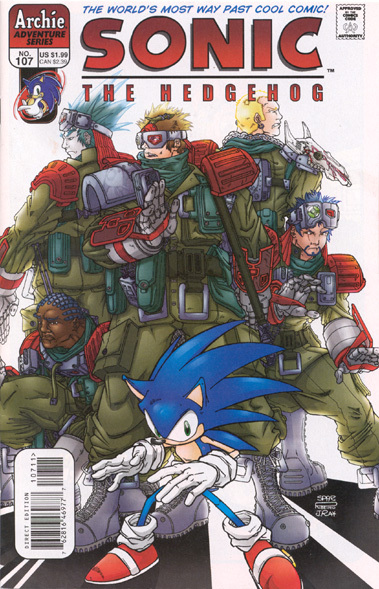 Crouching Hedgehog, Hidden Dragon Part Two: Things are heating up as Sonic continues defending the Hidden City of the Ancients from the dragon that besieged it in the last issue. Meanwhile, the rest of the Freedom Fighters do their best to keep damage to a minimum – both to the building and the citizenry, whose alliance the Freedom Fighters are counting on. It’s not easy – someone or something is intent on keeping them from accomplishing their mission. Who could it be? Reunification Part Two: It’s the moment Knuckles fans have been waiting for: the embattled hero has finally restored his family and friends back to their home of the Floating Island – but with the Dark Legion now part of the equation, can confrontation be far behind? 32 pages, $1.99, ships on Feb. 8. < Previous Post Previous post: TSS UPDATE: Happy (late) Birthday to The Sonic Stadium!